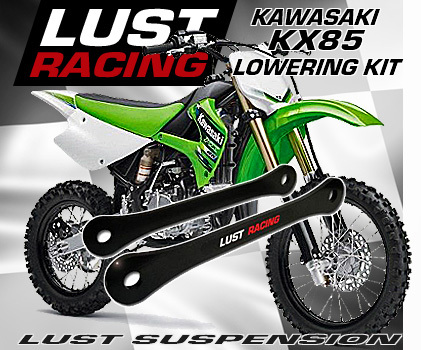 Lowering kits for Kawasaki KX 85 mini cross motocross (MX) motorbikes by Lust Racing Ltd. Kawasaki KX85 lowering kits will reduces the seat height of the bike, excellent for young riders. Our lowering links are made of SS400 super strength steel and are available for Kawasaki KX-85 motocross cycles. The links "dogbones" in the kit replaces the stock rear suspension links on the Kawasaki KX85 lowering kit so that younger, shorter and lighter riders can handle the bike with confidence.Lust Racing Kawasaki KX85 lowering kits will fit year models 2001 to 2019. 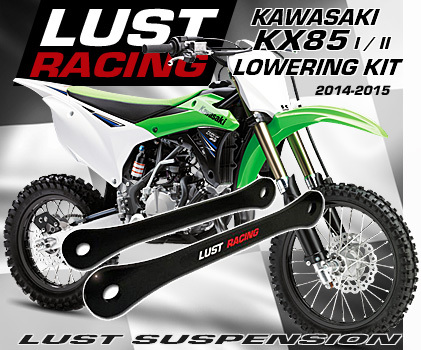 Lust Racing manufactures both rising jack up kits and lowering kits for Kawasaki KX-85 and other Kawasaki mini-cross bikes.